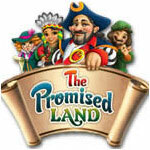 The Promised Land Game - Download and Play Free Version! 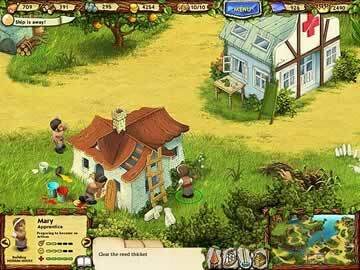 In the Promised Land, you work from the ground up in building a growing community of settlers. You'll quickly find that there is lots of work to be done in this untamed land. From assigning work responsibilities, battling pirates, finding food, increasing the skills of your workers, establishing a trade and constructing buildings, the success of the colony depends on your ability to make decisions. 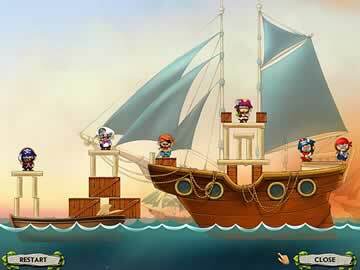 If you are a fan of adventure or simply love games that challenge you to make decisions, The Promised Land is sure to keep your attention. You are a member of a group of colonists in search of the Eternal Springs of Happiness. After a long and perilous journey, your group finally arrives at their destination. It is up to you and the members of your group to build up the new land and develop it into a thriving community. Can you help the group build the land of their dreams? You are guided by an advisor who walks you step-by-step in learning how to survive and flourish in this uninhabited land. To carry out actions, you choose a colonist and then carry them to the specific area where the action needs to be completed. For example, to gather wood, you must place a colonist near a tree so he or she can begin chopping it down. Overall, you control the daily operations and tasks that are needed to build the land into a bustling community. For every task you complete, you will receive gold coins. These are the basic currency used in The Promised Land and can be used to sell goods and build houses. Some tasks are timed and you will have a period of several minutes to complete them. Most timed tasks involve multiple steps and you will need to delegate work responsibilities between all of the colonists. This is where the strategy and time management aspects of the game come into play. You will have to make sure that there are enough colonists working on difficult or time-consuming tasks while also ensuring that other vital tasks are being completed. This includes gathering food and building materials. The game begins with five colonists in your group. Up to 50 colonists can live in your community, provided you have enough housing available for all of them. Colonists will refuse to work unless you have provided them with a place to live. Occasionally, you will encounter stranded colonists that would like to join your group. Every colonist in your group has specific likes, dislikes and you can also view their experience level. In keeping with the strategy theme of the game, you must become aware of the preferences of each colonist and have them work on tasks that they enjoy doing. If you instruct a colonist to perform a task that they dislike, their morale will drop quickly and their performance will suffer. You will also need to make sure that there is enough food in storage for all of the colonists in your community. When colonists are hungry, they will stop whatever work they are doing and walk over to the table to eat. If there is no more food available, colonists must waste valuable time to either wait for more food to be gathered or attempt to gather food for themselves. This will likely hold up other jobs and tasks that need to be performed on the island. Once you purchase a house, it will be placed on the island and your colonists will begin constructing at the site. You are able to view the inside of the house once it is completely finished. Each house comes with a certain number of rooms, but you will need to purchase and place other rooms in the house. In The Promised Land, it's time to put your strategy-making skills to the test!